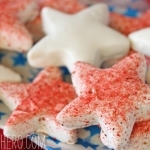 These Strawberry-Dusted Shortbread Stars are just awesome and good for so many occasions! They're deliciously crunchy and has a pure fruit flavor, without the overwhelming sweetness of typical dried fruit. Combine the butter, powdered sugar, lemon zest, and lemon extract in the large bowl of a stand mixer fitted with a paddle attachment. Mix them together on medium-low speed just until the sugar is incorporated and the butter is smooth. Add the salt and flour, and mix on low speed until only a few flour streaks remain. Stop the mixer and finish stirring with a rubber spatula, scraping the bottom and sides of the bowl. Scrape the cookie dough into a gallon-sized zip-top bag. Squeeze all the air out, seal up the bag, then roll the dough until it’s an even thickness—this is my favorite trick for easily rolling dough evenly. Put the dough on a flat tray, then refrigerate it until firm, at least 30 minutes. Once firm, preheat the oven to 350 F (176 C), and cover two baking sheets with parchment paper. Cut through the side of the bag to remove the dough, then cut out star shapes from the dough and arrange them on the parchment. The cookies won’t spread while baking, so you don’t need to leave much room between them. When you’ve cut out all the stars you can, press the dough together, re-roll it, and return it to the refrigerator to chill while the first batch bakes. Bake the cookies at 350 F for about 15 minutes, until they’ve lost the raw shine in the middle and the edges are very slightly colored. Remove the tray from the oven and let them cool for 5 minutes, then transfer the cookies to a wire rack to cool completely. Repeat with remaining dough until all of the cookies are baked. When you’re ready to dip and decorate the cookies, place the freeze-dried strawberries in a food processor and process them until they’re ground into very fine crumbs. (A high-speed blender might also work for this task.) The strawberry crumbs will start to absorb moisture soon after they’re ground, so don’t do this step until you’re ready to use them. Melt the white candy coating. If it seems too thick to dip easily, add a spoonful of shortening and melt it with the coating. Cover your work surface with waxed paper or parchment. Using dipping tools or a fork, submerge a cookie in the coating and then remove it from the bowl, letting the excess drip back into the bowl. Scrape the bottom on the lip of the bowl, then set it on the waxed paper. Repeat with 2-3 more cookies, then while the coating on the cookies is still wet, fill a small fine mesh strainer with strawberry crumbs. Hold it about 8-10” above the cookies, then gently tap the strainer to release crumbs onto the cookies, until you get a coating that you like. Repeat the process, dipping 3-4 cookies at a time, and coating them with strawberry dust, until all of the cookies are dipped and decorated. Let them set at room temperature, and then they’re ready to serve. Extra strawberry dust can be saved to enjoy on cereal or mixed into smoothies. Cookies can be stored in an airtight container at room temperature for up to two weeks.